For many working class families, life was hard in the early part of the twentieth century, and expectations were low. People worked long hours for low wages, and lived in poor and overcrowded housing. Skilled men could earn up to thirty shillings a week, and unskilled men could expect to earn no more than twenty shillings a week. Trades unions were becoming increasingly militant, and strikes happened frequently. In 1913 a strike of engineering workers lasted over two months in an attempt to raise the minimum wage for unskilled workers to twenty three shillings a week. There were also strikes on the railways, and in the coal mines, not forgetting the great unrest at nearby Wednesbury when the tube makers downed-tools. Food was expensive, so much so that some families spent sixty percent of their income on it, and malnutrition amongst children became commonplace. Due to the harder and more stressful living conditions, and the lack of modern medical care, life expectancy was much shorter than today, being around fifty years for men, and fifty four years for women. The turn of the twentieth century saw the dawn of the welfare state, but only in a modest way. 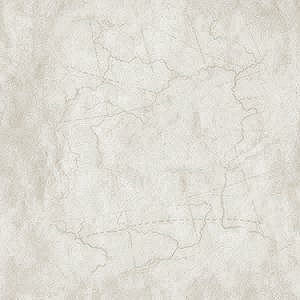 In 1909 the first old age pensions were paid to people over the age of 70. They were entitled to five shillings a week. Two years later the 1911 National Insurance Act was passed to provide sickness and unemployment benefit for people. The scheme was compulsory for all wage earners between the ages of sixteen and seventy. They had to contribute four pence a week to the scheme, which was supplemented by an additional three pence from the employer, and two pence from the state. In return, workers received free medical attention and medicine, and were paid 10 shillings a week for the first 13 weeks, and 5 shillings a week for the next 13 weeks. Unemployment benefit consisted of seven shillings a week, beginning after the first week of unemployment, and lasting for fifteen weeks in any single year. It was paid at labour exchanges, which first appeared in 1910. For many years Britain had been the dominant economic power in Europe, but by 1914 Britain was being outperformed by Germany, which had previously been an important customer for many of our largest industries. As Germany’s industries flourished, British exports suffered, and some industries began to decline. For some years imperialism had grown in most of the major European countries, which meant that at some time, the outbreak war was almost inevitable. It officially began on 28th July, 1914 with the assassination of Archduke Franz Ferdinand of Austria, heir to the throne of Austria-Hungary, and his wife, Sophie, Duchess of Hohenberg, who were shot dead in Sarajevo, by Gavrilo Princip, one of a group of six Bosnian Serb assassins. After the assassination, Austria-Hungary delivered an ultimatum to the Kingdom of Serbia and prepared to invade. The Allied Forces - France, United Kingdom, and Russia. The Central Powers - Germany and Austria-Hungary. Britain had a treaty with Belgium, and so declared war with Germany when the German army invaded Belgium and Luxembourg, on its way to France. Soon all the major European powers were involved in the war, which within a few years involved many countries throughout the world. When Britain declared war on 4th August, 1914 celebrations were held throughout the country. Most people believed it would be a quick and simple affair that would be over by Christmas. Patriotism was high, and large numbers of men rushed to join the forces to answer the call to arms. The government wanted 100,000 volunteers and began a large recruitment campaign which bombarded the public with posters. This was so successful that within a month 750,000 people had volunteered. Sadly it was not to be a quick affair. 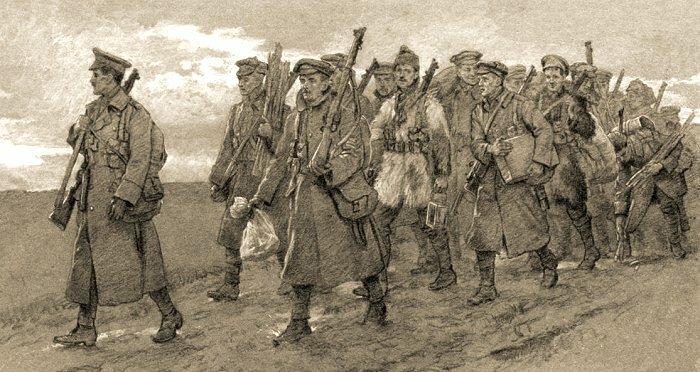 As the German troops entered France, the French and British troops moved northwards to meet them, and the massive armies dug-in, starting the terrible trench warfare which would last for four years. 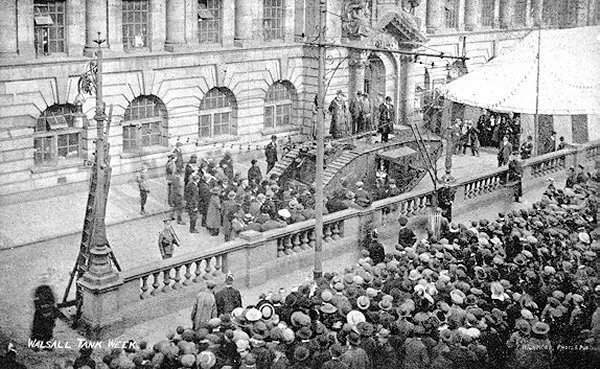 The day before the declaration of war was a Bank Holiday, and crowds gathered on The Bridge and in Park Street, awaiting an announcement. The Walsall volunteers on The Bridge. 11th August, 1914. From an old postcard. 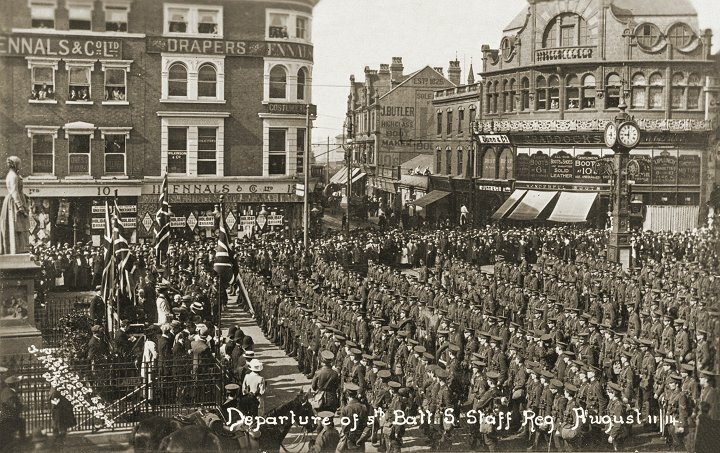 The Walsall volunteers, members of the 5th Battalion of the South Staffordshire Regiment were recalled from their annual camp and mobilised in Walsall where they were billeted in local schools. On the 11th August they paraded on The Bridge for a Civic farewell. After a speech by the mayor, they left for Whittington Barracks, Lichfield, and the next day travelled to Luton for training. They landed at Le Havre on March 1915. 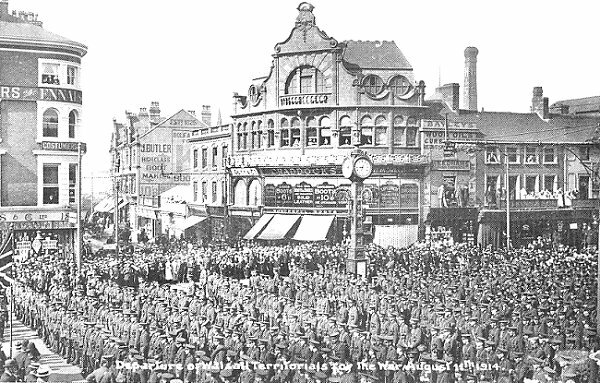 The battalion consisted of men from Walsall, Bloxwich and the surrounding area. Members of the regiment served at Mons, Ypres, Loos, The Somme, Saint Quentin Canal, and Gallipoli. 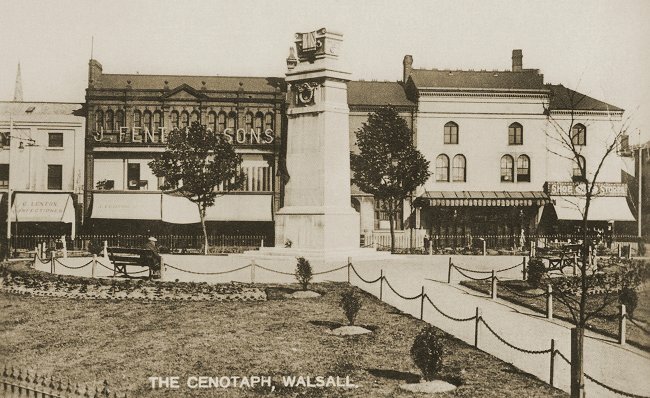 Over 12,000 men from Walsall joined the armed forces, but sadly over 2,000 of them never returned. Because so many men had joined-up, there was a shortage of labour. Industry was essential to the winning of the war. Factories worked flat-out producing vital war work and armaments for the armed forces, but initially suffered because of the shortage of skilled men. Their roles were taken-over by women, who for the first time were allowed to work in some of the more physically demanding factory jobs which had previously been considered to be only suitable for men. Women also kept many of the essential services in operation including the trams, the railways, and our farms. They also worked in munitions factories. Another view of the gathering on The Bridge. From an old postcard. Courtesy of Paul Bowman. In August 1914 Parliament Passed the Defence of the Realm Act which gave the government a range of new powers to prevent anyone assisting or communicating with the enemy. The press was censored, to keep-up people’s morale, and plans were made to ensure that scarce resources were correctly used. The Admiralty and the Army Council were given powers to take-over any factory or workshop for the production of arms, ammunition, or products for the war-effort. Within twelve months the shortage of munitions led to the government setting-up its own arms factories, and eventually taking over the vitally important coal industry. All manufacturers turned their skills towards the war effort including Shannon’s Mill where overcoats and uniforms were made for the armed forces, and the Talbot-Stead Company which supplied boiler tubes to the Admiralty. The futility of the stand-off between the vast armies meant that large numbers of people were killed or wounded, and enormous numbers of men were needed at the front. In the autumn of 1915 Lord Derby headed a campaign which resulted in around 300,000 new recruits, but it was still not enough to meet the needs of the army. In January 1916 the prime minister, Herbert Asquith introduced conscription for all single men aged between eighteen and forty, which was seen as the only way to get all of the troops that were needed. In 1915 the Germans declared an official naval blockade of Britain, and threatened to sink any ships sailing into British ports. The Americans immediately objected because many of their cargo ships sailed here, and the blockade was cancelled. Two years later it was reinstated, which caused the Americans to enter the war. Members of the Red Cross, at The Bridge, raising funds to buy more ambulances. From an old postcard. In January 1918 Walsall appointed its first two women police officers, the first in the Black Country. They were Miss Tearle, and Miss Williams. After undergoing basic training in London, and gaining some experience, they started their duties at Walsall in May 1918. They were paid 35 shillings per week, plus a wartime bonus of 10 shillings. 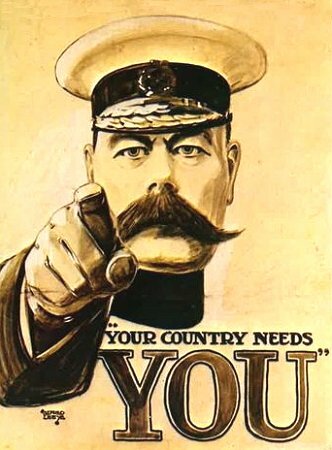 Perhaps the best known and most enduring image of the First World War is this one of Lord Kitchener. 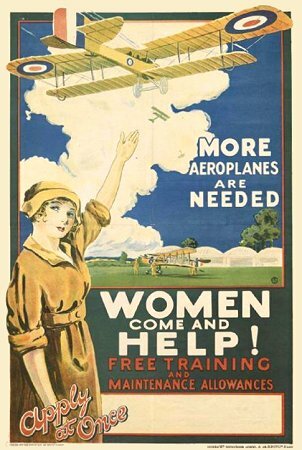 This propaganda poster urges women to help in building much-needed aircraft. Tank Week in Walsall. From an old postcard. 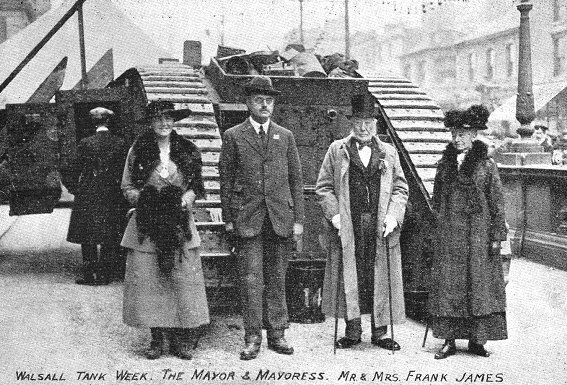 In March 1918 a British tank which had been given the name 'Julian' was placed outside the Town Hall for a week as part of a fund-raising scheme for the war effort. At the end of Tank Week a total of £832,207 had been raised. 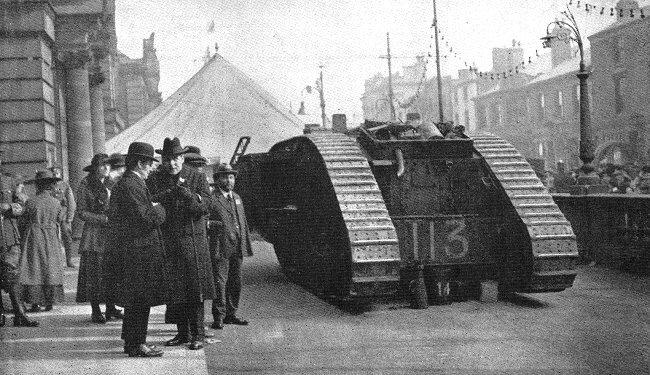 The tank then continued on its fund-raising tour of the country. Another view of 'Julian' the tank. From an old postcard. The blockade by the German U-boats led to food shortages, rising prices, and long queues at the shops. Both sugar and wheat were in short supply. Due to the shortage of wheat, the Ministry of Supply recommended that 20lb. of potatoes should be added to every 280lb. sack of flour. The situation worsened and led to the introduction of food rationing in February 1918. The weekly ration for each person included 15 oz of meat, 5 oz of bacon, and 4 oz of butter or margarine. 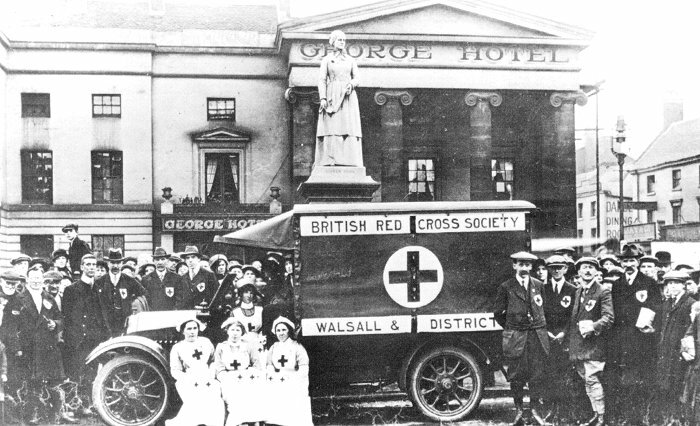 During the war thousands of Belgian citizens fled to this country, and Walsall quickly came to their aid. Hostels were set-up for around 150 people in Lysways Street, Moss Close, and at Aldridge, Bloxwich, Pelsall, and Rushall. The refugees were repatriated after the war. In 1918 after a German offensive along the western front, the Allies and the American forces successfully drove them back, leading to the armistice on 11th November, 1918, and victory for the Allies. The news of the victory quickly spread throughout Walsall. The Walsall Observer received a telephone call informing the staff that the war had ended. They hung a yellow banner from a window on the first floor, on which was written the word PEACE. Church bells rang, factory hooters sounded, flags were flown everywhere, and large crowds gathered in the town centre. Speeches were made on The Bridge, buildings were illuminated, bands played in public parks and everyone celebrated the return to peace. The peace agreement was formally signed on 28th June, 1919. Peace celebrations were held in the town on 19th July, including a Civic procession, and tree planting ceremonies at Blakenhall and Bloxwich. On 24th July the council decided to build the war memorial in Bradford Place, and cast bronze tablets for the Town Hall, which listed the names of the dead. A total £9,208 was raised for the purpose. Other events included the building of the war memorial in Darlaston, and the building of the Memorial Park in Willenhall to honour those who had given their lives in the war. The Cenotaph, Bradford Place. From an old postcard. The memorial to John Henry Carless. 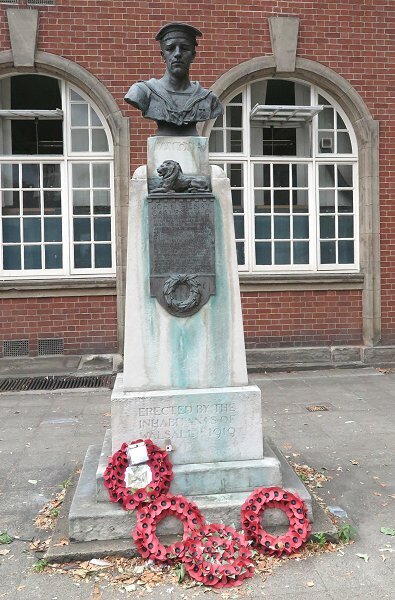 Walsall also erected a memorial to John Henry Carless who received a Victoria Cross. 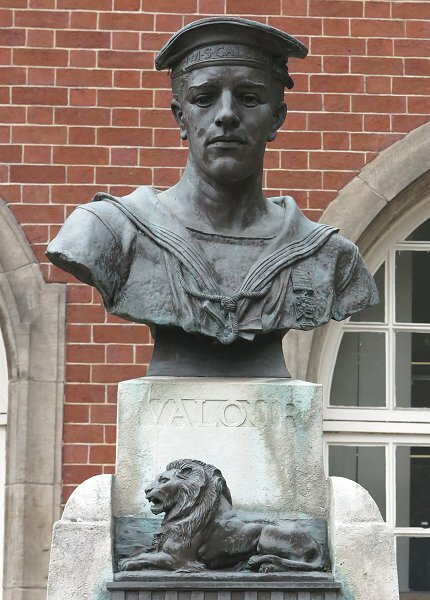 His bust stands on a plinth outside the museum in Lichfield Street. He served as an Ordinary Seaman aboard HMS Caledon which took part in the Second Battle of Heligoland Bight on 17th November, 1917. During the battle he was working as a rammer on one of guns, and was wounded in the abdomen. Although severely injured he remained at his post, and helped to move other casualties. After collapsing once, he fell again and died. He was just twenty one years old. 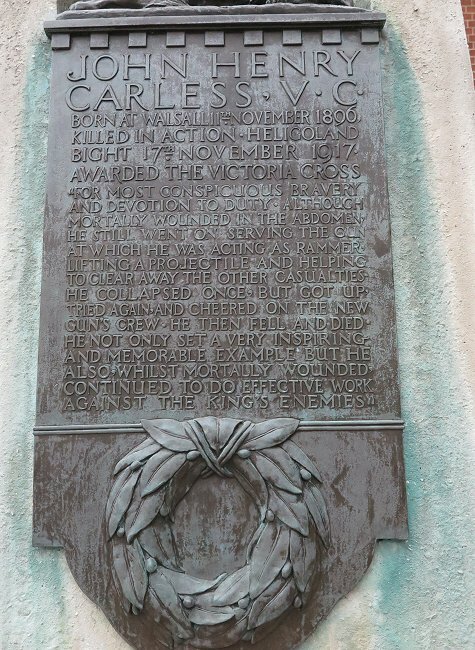 In December 2009 a memorial plaque commemorating John Carless and two other recipients of the Victoria Cross was unveiled at the Town Hall. The other two recipients are James Thompson, and Charles George Bonner. The war greatly helped the cause of women’s emancipation and gave them a greater degree of independence than before. Although many women lost their jobs when the hostilities ended, and the men returned, they now had a more prominent status in society and increased expectations for the future. The Representation of the People Act 1918 gave women over 30 years old the right to vote, but they had to be a member, or married to a member of the Local Government Register, or a graduate, voting in a University constituency. They had to wait another ten years until the passing of the Representation of the People (Equal Franchise) Act 1928 to gain the same voting rights as men. A close-up view of the memorial to John Henry Carless. The following information was kindly supplied by Mark R. Cooper, Bertie's Grandson. Bertie was born in Wolverhampton on Sunday 13th April 1890, to John Henry Crick and Bertha Elizabeth Crick. His father, a baker, moved to Wolverhampton from Northampton and Bertie became a moulder in a local foundry. He lived at 111 Green Lane, Walsall and married Edith Sarah Kettledon, a laundress from Wednesbury. They were married on Friday 26th December, 1913 at St. Michael’s Church, Caldmore and moved to 66 Orlando Street, Walsall. At the outbreak of war, Bertie enlisted in the South Staffs Regiment and was drafted to Gallipoli on Saturday 11th September, 1915. In December of that year, when the British troops were withdrawn from Gallipoli, he served in Egypt. He returned to France on Saturday 24th February, 1917 and was promoted to Corporal. His battalion moved into Belgium and took part in the terrible trench warfare that characterised the war. On Sunday 15th July, his battalion moved from Camp 'O' near Poperinghe to the trenches about a mile north of Ypres, to relieve the 4th and 5th battalions. Marching to war. From an old postcard. The trenches were in full view of the German artillery on nearby Passchendaele Ridge. The German troops bombarded them with shells and rifle fire, which resulted in many casualties. On 17th July, during his second day in the trenches, Bertie was seriously wounded, either by an exploding shell or rifle fire and died. He was just 27 years old. The battle continued until 31st July when the allies captured the German held Passchendaele Ridge. During the battle over 300,000 British and allied soldiers were killed or wounded in one of the most horrific battles of the First World War. Bertie is buried in La Brique Military Cemetery No.2 with his colleagues, in grave 1.W.5. He is commemorated on the Roll of Honour at the Menin Gate Memorial in Ypres, and in Walsall Town Hall, and also in St. Matthew’s Church. His widow Edith, later married Sergeant Joseph Booth Gretton in 1919 and they lived at Clay Street, Penkridge. He also fought at Ypres, where he was gassed and discharged, being unfit for service.